Vacation rental house. Sleeps 6, 3 bedrooms, 1.5 bathrooms. No pets allowed. Nearby Lagoons. Not property view. 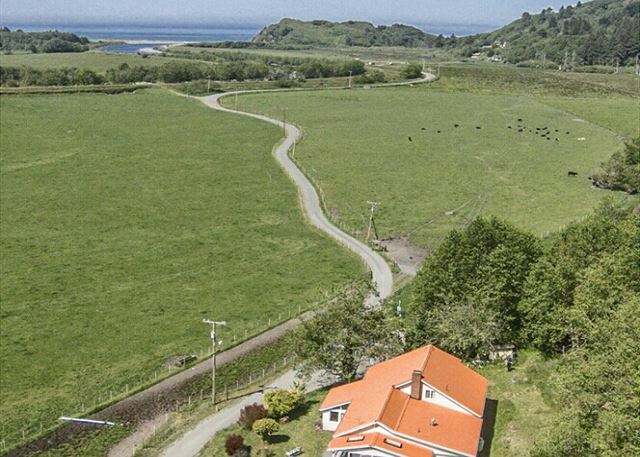 Rainbow's End Country Home with Pasture views and short drive to ocean and the popular Prairie Creek Redwoods State Park. Spacious home has a Living Room, Sun Room, Den with small TV, Full Kitchen and Dining Area, covered porch to take in the beauty and wildlife. This 3-bedroom, 1.5 bath home, is just 4 miles to the Redwood Park Entrance, in the outskirts of Orick. The home itself is quite charming, welcoming, and comfortable and the natural surroundings make you feel so relaxed. So, when you are taking a break after exploring the beautiful Redwood lined trails, beaches, lakes, lagoons, creeks, herds of Elk, bald eagles, and everything else our area has to offer, you will have a beautiful home to come back too. All 3 bedrooms of this home each have a queen bed, and the couch in the living room has a full-sized sofa bed. Besides the 3rd bedroom with a half bath that is upstairs through the den, the rest of the living space is all on the 1st floor. This includes a full kitchen, living room, sun room, den, 2 more bedrooms, a half bath and separate shower room and a mud room off the kitchen with a washer & dryer for your convenience. This will be a great base for your Redwood Coast exploring! Disclaimer - Although infrequent, we are subject to power outages due to weather and downed trees. Should the home lose power, the pump cannot work, and the home will not have water. The house was clean, the decor was charming, the rural setting was delightful and quiet, the ocean was nearby, and we were only a short drive from spectacular trails through the redwoods. We would love to return again. The Rainbow's End Country Home is definitely a charming surprise for many. Although in a very rural setting, it is just a short distance to the beach, to the highway, and to the Natiional and State Parks. There are many wonderful nearby trails, as well one of the largest Elk herds in Northern California. Despite appearances, Orick burl shops are spectacular inside, and the Palm Café has some of the best homemade pies in the County. Thank you for choosing the Rainbow's End and for booking with Redwood Coast Vacation Rentals. We hope to see you again. This is a wonderful home, warm, bright and inviting! The owners have created a space that is very friendly and welcoming, from the moment you walk in the door. Details seem very important to the owners and they have not missed anything! This home is a quick bike ride to the ocean, on a very quiet road. The most noise you will hear are the cows "mooing" across the road. Thank you for the wonderful review of the Rainbows End. This is such a great home in such a convenient location, I am so glad to hear you enjoyed the home. Thank you for choosing this house and for booking with Redwood Coast Vacation Rentals. We look forward to having you return to our lovely home. Excellent experience, I would highly recommend it. Thank you for your recent stay at the Rainbows End and for choosing Redwood Coast Vacation Rentals for your vacation needs. Great place to stay in Redwood&#x2019;s! This home is one of my favorites and I am pleased to hear that you found it to be a great place to stay while visiting the Redwoods. This home definitely feels like "home" and is a great place to return to at the end of the day. Thank you for your recent stay and for booking with Redwood Coast Vacation Rentals. We hope you will visit us again soon. Our family has enjoyed the outdoors for years. Our National and State Parks always forefront. Education always at the top of the list. Most spent camping but as I've aged, as have my now adult children, we've come to appreciate the vacation home rental. This is certainly not the first, nor will it be the last. This August 3 thru 8, 2018 we were blessed to have secured Rainbow's End for a visit to the Redwoods National and State Parks. I live in a very rural setting in Iowa. Rainbow's End was like stepping into my own home. Quiet, comfortable, peaceful and surrounded by beauty found no where else on Earth. The home is situated within short travel distances of everything the Parks offer. The sea, the forests, the National Park Service programs, Ranger led hikes and the Visitor Centers. I found myself in the mornings, early riser, in the company of wild turkey, a pair of golden eagles, the covey of quail, hummingbirds and the black tailed deer. The area is rich in history worth exploring. Culturally, you need go no further than Orick. I found the locals to be open and friendly. Not once was I made to feel unwelcome. Had coffee at the Palm early and learned much of the area from the proprietors. The local grocer, hardest working man in Orick, always engaging. And, without a doubt, the coolest little convenience store you will ever need. Just look for the "one" gas pump. I could go on and on. But one element puts you right where you need to be and that is the home. Rainbow's End is the perfect venue to make your adventure begin. You will not make a better choice. Everyone whose efforts made my visit so memorable deserve a heartfelt "Thank You", but a very special "Thank You" goes to the property owners for offering such a home to others. I will remember this kindness forever. This is one of the most touching reviews I have ever read. I have no words to add, other than Thank You for choosing the Rainbow's End and making us a part of your memories. We had a wonderful stay in this very spacious, clean and well equipped house. Watching the fog roll in and all the birds that would gather outside the kitchen window was spectacular. The kitchen had everything we needed, and we enjoyed the games and books as well! It was fantastic to be so close to the entrance to the Redwoods. The Rainbow's End is such a great house. It is very spacious and comfortable and the view is spectacular. The proximity to highway 101, makes this home a great home base for visiting the redwoods and many other scenic sites in the area. I am glad to hear this home was a good fit for you and your family and that you all enjoyed your time there. The house was great - a very comfortable country home with a homey friendly feeling. The Rainbow's End is a charming home to stay in while visiting the Redwoods. The country feel is quite comfortable, and the house layout is quite nice. The views overlooking the pasture are very peaceful and the highway is just a short distance to go visit the neighboring towns, the redwoods, and various scenic sights. I am happy the home was a good fit for you and your family and I hope you will make it back to stay with us again. The Rainbow's End is one of my favorite homes. Easy to find and get to, and close to most all of the scenic redwoods. I am glad the home was a good fit for you and your family as a base camp and that you enjoyed your stay. The Rainbows End is the perfect home to serve as a base for visiting the northern redwoods. I have found some interesting treasures on the beaches near there, and it is close to state parks, and many hiking trails, fishing and outdoor activities. The Palm Cafe and the Edebees Snack Shack actually do offer dining throughout the day. The Palm Cafe has a reputation for great homemade pies and the Edebees Snack Shack actually offers way more in the line of dining than just burgers. About 15-20 minutes south is the town of Trinidad which has several restaurants and quite a nice grocery store offering many organic options, a wonderful deli and a fish market. This is a really great home, set in a rural farm setting, but in such a beautiful location for enjoying our north coast. Lovely house with everything I needed for a vacation around the Redwood Forest - comfortable,clean,beautiful walk to beach and close to the Redwoods. Thank you for your recent stay at the Rainbows End, and for booking with Redwood Coast Vacation Rentals. This is a wonderful home to stay in, as it is close to many scenic areas of our north coast. Not only is it a comfortable home, it is close to the beach, the redwoods, several lagoons, and many hiking trails in the area. I am glad you enjoyed the home and we hope we have the opportunity to accommodate you again in the future. We wanted the closest large home to Redwood State Park, and were very happy with how quickly we got to the amazing trails and Fern Canyon. The kitchen was very well stocked. Each bed felt comfortable. When a minor issue came up, the management was quick and solved it, and was also kind. My children were delighted with the plethora of kid books. The Rainbow's End is a wonderful home. I am so glad to hear that it was a good fit for you and your family, and that you were able to enjoy some of the Redwoods and one of my favorite spots, Fern Canyon. thank you for booking with Redwood Coast Vacation Rentals; we hope you will return to visit us again in the near future. Our son and his family stayed here while we were down the street in another house. They loved it, their girls liked seeing the cows across the road. They found the house very clean and pleasant. We would absolutely recommend this house for a family who wants a vacation in the country, between the majestic sequoias and the beach. Thanks again to the managing staff who do a wonderful job. I am glad to hear you liked the house and I didn't realize you were in another home nearby. What a treat to spend time in the country with family, and still have separate accommodations to go home to. Our Orick homes are so popular, as they are just the perfect places to get away from it all. Thank you for your kind words and we hope you will all return to visit us up here in Northern California. Great Find in the Heart of the Redwoods. Clean. Up to Date. QUICK TAKE: Great find! We have rented vacation homes for many years and this was one of our favorites. House seems to have recently been totally updated with quality fixtures. Everything is neat and clean. The beds were more comfortable than mine at home. The kitchen is well supplied. I liked the spring water dispenser. Nice selection of boardgames and a variety of books are available. The TV room has satellite and HBO. It is set off by itself and two doors separate it from the rest of the home with remarkable sound isolation. Taken as a whole, one of our favorite vacation places. Our days here were the highlight of our Northern California vacation. OTHER DETAILS: The town of Orick is a bit run down. The only claim to fame here is proximity to the redwood forests There is a small grocery store that is no better than fair (A better store is down the road in Trinidad). There's also a diner that is as you would expect for a tiny country diner. The main advantage here is that you can get to the redwood forest to begin your hike before anybody else gets there. On one of our hikes on the Jamer Irvine Trail we arrived by eight or nine in the morning and we didn't really see any other hikers till we are on the way back at around noon. This home is located about a mile from the beach. It is a very quiet setting. We walked down to the beach -- it was about a mile each way. You can also drive there. We found lots of blackberries along the road. Word of caution here – to get to the beach you have to navigate about 20 yards through driftwood with very hazardous footing. The beach itself is stunning. No development at all. Beautiful beach. What a great and thorough review of Rainbow's End and of Orick. Not much more I can add. Thank you for choosing Redwood Coast Vacation Rentals. We loved this home - and it felt like a home, with everything you could need. We stayed here for three nights while visiting the area parks. Our time in the home was as wonderful as our time on the trails and beaches. The bucolic setting is so relaxing. We enjoyed the rabbits, goldfinches, swallows, birds singing in the morning and frogs at night. We saw quail just down the road and liked the easy evening stroll to the mouth of Redwood Creek. There are comfortable beds, lots of towels and blankets, and the kitchen is very well stocked. There are many places to hang out, both inside and outside. We were pleasantly surprised to find a gas grill, which we didn't see in the description. Before you cook, watch for the pair of tree frogs that like to sit on the grill under the cover! Now, when can I go back? What a wonderful review of your stay at the Rainbows End Country Home. We cannot wait to have you back! Perfect for our family and had everything we needed for our stay. Thank you for choosing the Rainbow's End Country Home for your vacation. We hope we will have the opportunity to accommodate you again. We loved this house. So many windows. So quiet. A perfect getaway from the central valley heat wave. We particularly enjoyed the well stocked kitchen. We were able to really cook and then enjoy the view while we ate. It was a very nice stroll to the beach, but also drivable. The Rainbow's End Country Home is a great family home to get away to, especially out of a heat wave. I am glad it was a perfect fit for you and was able to accommodate your family well. Being so remote, a good kitchen helps! Thank you for choosing Redwood Coast Vacation Rentals and we hope you will return to visit us again soon! Thank for booking the Rainbow's End Country Home. We hope we can accommodate you again. You & your family were our second family staying here and we were very excited to have you. Thank you for treating the home respectfully as well!